CAMBRIDGE, Mass. 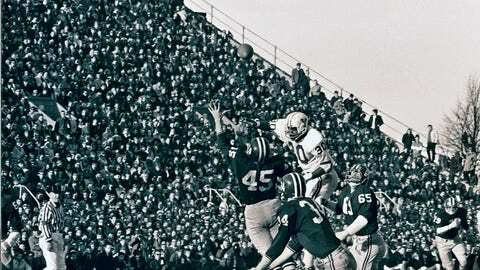 (AP) — Sixty-five members of the 1968 Harvard football team are expected back in Boston this weekend for the 50th anniversary of the most memorable entry in the 143-year-old history of The Game. A luncheon for returning Yale players was canceled for lack of interest. Not all ties come out even. Fifty years after a furious comeback against Yale left Harvard celebrating a 29-29 “victory,” players from both sidelines have no doubt who won and who lost in what is still considered one of the greatest games in college football history. The Game in 1968 had a backdrop of social unrest that reached into the locker rooms, where players who protested the Vietnam War dressed alongside those, like Harvard safety Pat Conway, who fought in it. Martin Luther King Jr. and Robert Kennedy had been assassinated; riots shook the Democratic National Convention. Change was also coming to the schools: A week earlier, Yale president Kingman Brewster announced that the school would admit its first class of women; he was “hissed and booed,” The Yale Daily News reported, by male students who would have to move out of their residential college to make room. But if the students sensed that tradition was crumbling around them, there was still The Game. Always the season finale, in most years the matchup gave each school one last chance to salvage its season — perhaps by ruining its rival’s. The anticipation was even more intense in 1968: For the first time in almost 60 years, both teams arrived with a perfect record, and an Ivy League title was on the line. Although the gap has grown between the Ivy League and college’s football factories, Yale in 1968 was a budding power that received votes in The Associated Press Top 20 and would see three players drafted by the NFL, including first-round pick Calvin Hill. Dowling finished ninth in the Heisman Trophy voting, with the fourth-most first-place votes (still far behind winner O.J. Simpson). Harvard halfback Vic Gatto remembers people ringing the field to watch practice — not just alumni, but Cambridge residents, too. And it wasn’t just the Yale game that sold out. Under coach Carm Cozza, a future Hall of Famer, Yale did not trail in a game all season and was the heavy favorite against Harvard. Dowling had not lost a game since he was in the seventh grade and was known around campus simply as “God”; he was also the inspiration for the character B.D. in the Doonesbury comic strip penned by Yale classmate Garry Trudeau. Hill, the future Dallas Cowboys star, was his favorite target. So, few were surprised when Yale went ahead 22-0 in the first half. Nor was there much concern on the Bulldogs sideline when the lead was down to 29-13 in the fourth quarter. Yale was driving again when a fumble gave Harvard the ball at its own 14 yard-line and 3:34 to play. Backup quarterback Frank Champi led Harvard downfield for a score with 42 seconds left, then the Crimson converted the 2-point conversion on a second try after a phantom pass interference penalty on the first. Harvard recovered the onside kick, and marched to another score, culminating in Champi’s 8-yard pass to Gatto as time expired. Fans stormed the field, only to be cleared away for the decisive 2-point conversion. When Champi connected with Pete Varney to tie it 29-29, the stands emptied anew. “It was so improbable, the kind of finish if you wrote a movie script about it, nobody would believe it,” said Weinstein, who would be drafted by the Miami Dolphins in the eighth round. The result left the schools sharing the Ivy League title, but the winner was obvious. The Harvard Crimson, the student newspaper, ran its story under the headline “Harvard Beats Yale 29-29,” and that’s the way the outcome has been viewed for half of a century since. After all this time, Dowling still bristles at the notion of a Harvard victory. As implausible as the comeback was, the tie score was even more unlikely. Yale inexplicably and uncharacteristically went for two after scoring its third touchdown to make it 22-0. (“I have no idea why we did that,” Dowling said.) Harvard missed an extra point after its first score, leaving the Bulldogs with a 22-6 lead at halftime. Dowling and Gatto will take part in a ceremonial coin flip on Saturday when Harvard and Yale (both 5-4, 3-3 Ivy) meet for the 135th time, and the ’68 Harvard team will be recognized at halftime. Nothing more than third place in the Ivy League is at stake. Instead, the history comes from the venue: The Game will be played at Fenway Park — the first off-campus site since the 1894 matchup in Springfield, Massachusetts, that was so violent that the Harvard faculty voted to discontinue football entirely; they were overruled and the rivalry was put on hold for two years instead. Although alumni and students have griped that the urban ballpark leaves no option for tailgating, Harvard coach Tim Murphy said he is looking forward to taking the field in yet another historic arena.